Please join in the TOS Campaign for Kindness taking place throughout October, 2017. The entire month of October, 2017 becomes a canvas for your acts of kindness, large or small. You can structure it any way you like. Perhaps you join in a community project on one day in October. Find one by clicking here. Perhaps you devote a week to carrying a bag on your daily walk, picking up at least one piece of litter per day. Or maybe it's seven pieces per day--whatever is comfortable for you. Maybe you commit to one act of kindness each day during October, even if it's just making eye contact and smiling at someone, holding the elevator, letting a driver into your lane, sending a comforting thought, etc. Maybe some of your family members or co-workers would like to join you in performing acts of kindness. The size of the act doesn't matter. What matters is that it comes from your heart and feels genuine to you. We’re asking that each person who participates send an email by November 15 to TOS Liaison Coordinator Kathy Gann (info@DenverTS.org) to let us know what you did, or even a fraction of what you did. Just a brief note will be fine. Don't worry about looking like a "credit grabber" because your acts of kindness will be published anonymously. Who knows how many people will see your kindness and think, "I'd like to do that too!" 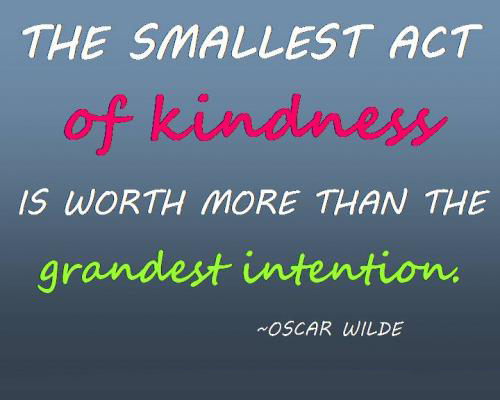 And then your kindness multiplies, and that's the whole idea.